Komatsu entered the compact excavator market in the mid-1990s. The company’s compact excavators have many of the same features as Komatsu’s larger excavators with the same built-in reliability and quality, including steel castings in high stress areas like the boom foot. In addition, design improvements address customer needs like a dozer blade for backfilling and auxiliary hydraulics for powering attachments. Komatsu currently offers six excavators in the 0- to 8-metric-ton size classes. 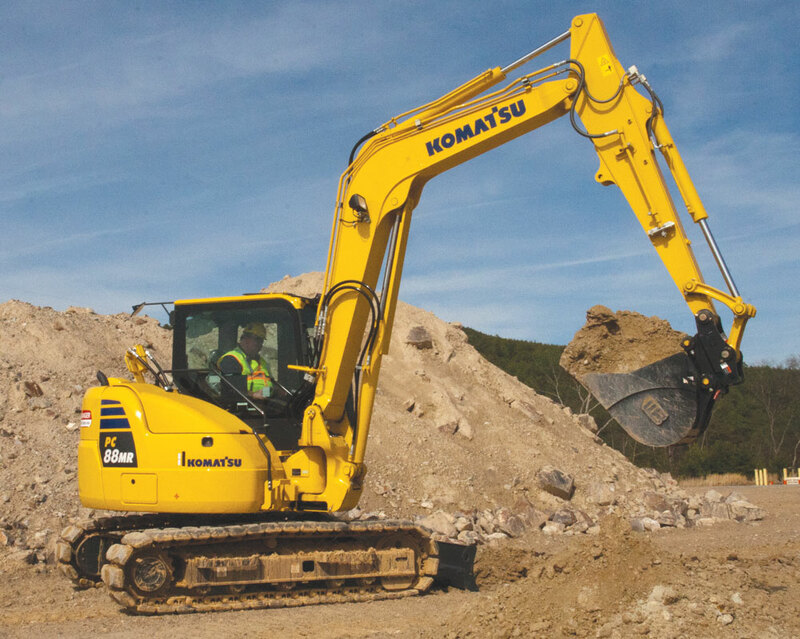 All Komatsu compact excavators meet Tier 4 Final requirements without using selective catalytic reduction (SCR) and without the need for diesel exhaust fluid (DEF). The smallest excavator is the PC30MR-5, and the largest is the PC88MR-10. The smaller machines (PC30MR-5 and PC35MR-5) are extremely versatile because of their light weight, ample power and large range of work tools available through OEMs such as Werk-Brau. The PC45MR-5 and PC55MR-5 in the 4- to 5-metric-ton size class, offer features rarely found on compact equipment, such as KOMTRAX equipment monitoring, auto-idle shutdown and economy modes, as well as a two-post ROPS canopy, providing class-leading visibility. For harsher climates there is a cab option with climate control, a defroster and provisions for a radio. All four machines are designed to outperform the competition in applications ranging from landscaping and utility work to general construction work. The PC78US-10 takes the compact line a step further by offering a 7-ft, 5-in. arm with a setback boom, perfect for working in confined spaces. The PC78US-10 extends only 9 in. from the tracks at the rear for maneuverability. Advanced features such as closed-center load sensing hydraulic system (CLSS), a variable flow turbo and enhanced working modes means the PC78US-10 is up to 3 percent more productive than the previous model. There is also a standard two-way blade available and an optional 8-ft, 1-in.-wide blade, when equipped with the wider 24-in. triple grousers. Finally, the PC88MR-10 is an 8.5-metric-ton excavator with a swing boom and again, true tight tail performance. Similar to smaller excavators, the PC88MR-10 features booms and arms constructed with thick plates of high-tensile-strength steel and piping for optional attachments such as thumbs and hammers. The PC88MR-10 includes a pattern change valve for quick and easy switching from excavator controls to backhoe controls. With available road-liner shoes and a power angle blade, the versatile PC88MR-10 fits in well on any general construction jobsite. Learn more about Komatsu here.